As Leg 4 of the Volvo Ocean Race neared its halfway point on Tuesday, any memories of the freezing cold Southern Ocean had long been banished. With every mile that the fleet climbs further north through the South Pacific, so the temperature of both the air and water rise too. Gone are the days of wearing countless layers of weather-proof clothing in a desperate attempt to stay warm and dry. Instead, seven days into the 6,000 mile leg from Melbourne to Hong Kong, the Volvo Ocean Race sailors are battling extreme heat as they close in on the Equator. The lack of breeze in the Doldrums only compounds the problem, slowing their progress through one of the most notorious climate zones for sailors. Usually lighter airs give sailors a chance to rest ahead of the next big blow but there’s no respite from the heat – it’s hotter down below than it is on deck. The blistering speeds of the opening few days of the leg might too be a distant memory but the racing continues to heat up. 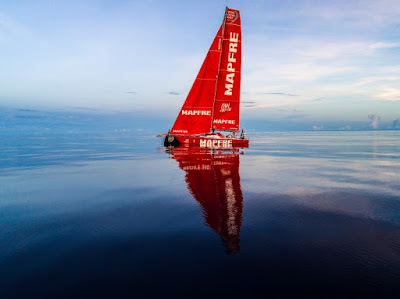 At 1300 UTC Dee Caffari’s Turn the Tide on Plastic topped the Leg 4 leaderboard as the most westerly boat in the fleet, with the Vestas squad, team AkzoNobel, Dongfeng Race Team and MAPFRE all lined up alongside them across a 15-mile gap. It’s so close at the front that most boats are in sight of one another after 3,000 miles of intense ocean racing. Team Brunel were just 11 miles directly behind Turn the Tide, while Scallywag was some 30 miles back. Although Hong Kong lies some 3,000 miles to the north west of the fleet, the short-term goal is to get north as quickly as possible to reach the trade winds. Once into this stable breeze the teams will be able to swing their bows left, open up the throttles and start knocking off the miles to the Leg 4 finish. But this respite is still some 36 hours away.